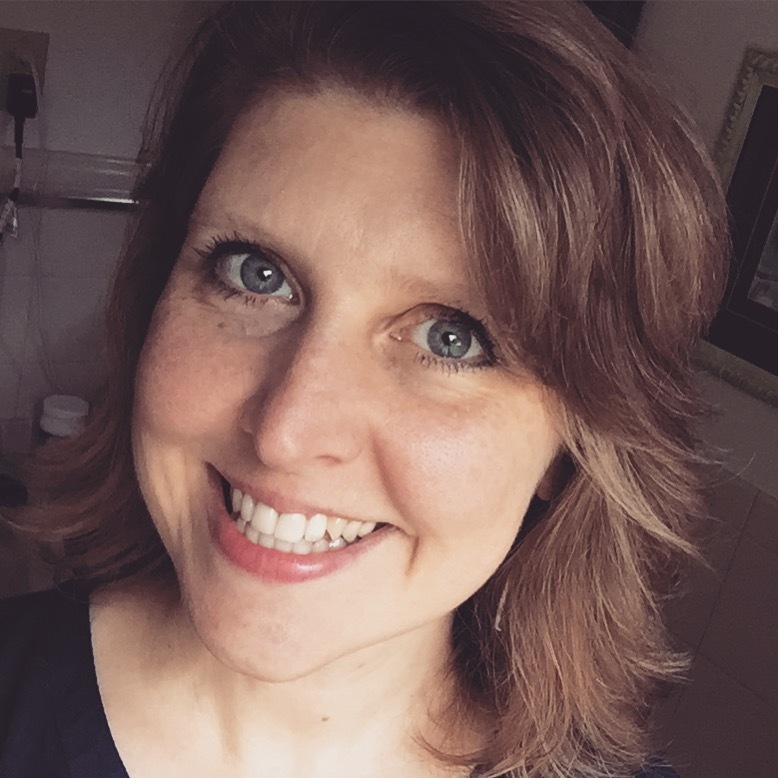 Literature is a broad field, but I’m going to try to tackle it in one blog post, hitting some highlights that homeschool moms of middle schoolers and elementary students should zero in on. For the grades before high school, I can pick out three main aspects of literature that you need to focus on: elements of fiction, figures of speech, and genre. 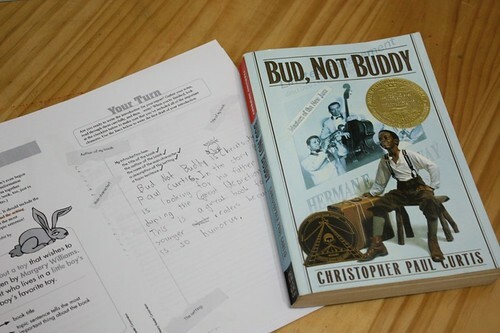 In high school, students are studying specific authors and the literature of different time periods. But until then, build a solid foundation of those three areas, elements of fiction, figures of speech, and genre, with living books of your choice. (Setting) You see a mental picture of the setting, but how does the author make that picture appear in your mind? (Character) You know that Sam is the hero and Jake is the villain, but how does the author endear you to one while you hate the other? (Mood) You have a definite feeling as you read the book, but how would you label that feeling and how did the author make it happen? (Point of view) You know that some books let you in on what everyone is thinking while other books only show one person’s thoughts. What are those different kinds of perspectives called? (Theme) You come away from that great living book with a sense of something bigger than yourself. What is that universal truth that the author is portraying and how did he do it? Some children will resist this kind of deconstruction of a novel or short story. There is validity to simply enjoying a work of literature, letting the elements of fiction do their silent work without picking them to pieces. But we want our children to be critical thinkers at the same time, so do force them to analyze at least some of the books you read, especially the classics. 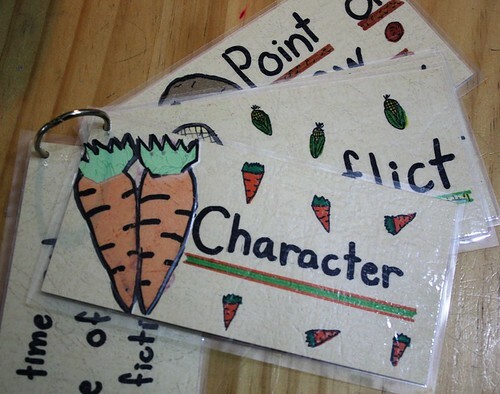 For color printables, visit this Squidoo lens– Elements of Fiction. 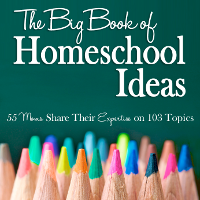 There are mini posters, notebooking pages, flashcards, and minibooks. Study elements of fiction on their level. For example, younger children are going to struggle with grasping the difference between third person omniscient and third person limited. Wait until they are ready for that. For now, just have them identify who the narrator is and how much he seems to know. Remember that an understanding of literature grows year by year as children mature and as they have more experience with increasingly difficult texts. Don’t think you have to master everything in a single year. Literature is an area that requires repetition. Fortunately for us, there are thousands of wonderful books to read. 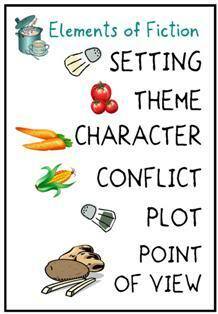 Another tip — be clear about the difference between the plot of the story and its theme. Students often confuse these, but this is a critical distinction. Developmentally, most children can’t identify theme until the pre-teen and teenage years. Theme is so abstract that younger and concrete learners struggle with it. If it is too hard, expose your child to it and move on, knowing you have dozens opportunities in the future to revisit theme. Character sketches are one of the easiest places to start with writing about the elements of fiction. Choose a main character and describe him with a single adjective. Then list three (or more) specific things in the book that demonstrate that quality. Usually it will be the character’s actions or thoughts. 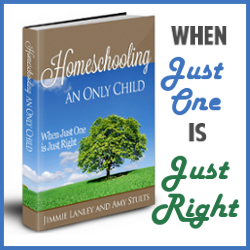 Help your children see that the author need not state outright that Sam is courageous. Instead he shows Sam facing fearful situations with calm bravery and sacrificing his own safety to protect others. This second area is a lot of fun to me because I love words. Hopefully, your children are being exposed to lots of quality literature that uses a variety of figures of speech, poetic devices, and literary techniques. They can probably intuitively understand many of the devices even though they may not have ever consciously thought about them or known their correct names. You can use a workbook as a base of a formal study, but reading about simile once in a workbook is not going to mean that your child has mastered it. Create some format of review; index card files are great for this purpose. Write down the figure of speech as you study it. Then periodically have your child look through the box and identify figures of speech in the books you are reading. If you spot one, have your child label it with the help of a glance through the card file (or whatever format you choose). The workbook that we use is Figuratively Speaking for grades 5-8. It covers forty different literary terms with a definition, examples from literature, and a few exercises. It serves as a good foundation and reference. Even as a former language arts teacher, I admit that I like the security of a comprehensive workbook to guide lesson planning. If it makes my life easier, it’s really worth the $10 or so dollars. Genre may be as easy as a trip to the library because many libraries tag juvenile and young adult novels with genre stickers. There are workbooks that you can use as a foundation to study genre, but the most effective way to learn them is to read books. Around fourth grade, start verbally labeling the books you read with the correct genre so that your child comes to understand what they are. A workbook that I am familiar with and recommend is Literary Genres (for grades 6-9). It’s simple and inexpensive. If you feel that you need some sort of base from which to work, I recommend that resource. 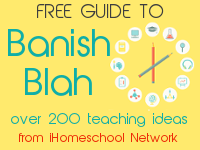 For some freebies try these PDF resources. They are not true substitutes for the workbook linked above, but they would serve as good complements to it. The Genre taxonomy is a good place to start if you want help creating your own study. Genre Taxonomy diagrams with genres supposedly to be covered in grades 1-5. All that I’ve written in this post presupposes that you have selected books to read. What should you read for your literature studies? In one sense, it really doesn’t matter. As long as you are choosing living books in a variety of genres, you can cover the three areas I’ve listed above. There are lists of classics that you can begin to tackle, but I personally recommend reading books that complement your curriculum (history, science, art, music) and books that are enjoyable to your children. For more help on choosing living books, visit my article Finding Living Books. Thank you for this timely information! I’m trying to really work with my daughter this year on beginning literary analysis. I will be starring it in my reader so I can refer back. You could check out HOD’s Drawn Into the Heart of Reading. We have it and love it.